SANTA CLARA, Calif. (AP) The San Francisco 49ers have reportedly acquired their quarterback of the future by trading for New England backup Jimmy Garoppolo. ESPN reported Monday that the Niners dealt a 2018 second-round pick to the Patriots for Garoppolo. San Francisco (0-8) had been expected to either draft a quarterback high in the first round next year or try to acquire a proven starter like Kirk Cousins in free agency. Instead, they decided to strike early and put the fate of their franchise in the hands in a quarterback who has started just two games in four NFL seasons. Both teams have declined to confirm the trade. Garoppolo won those two starts in place of a suspended Tom Brady at the start of the 2016 season. He completed 42 of 59 passes for 496 yards, four touchdowns and no interceptions. He got hurt in the second quarter of his second start and has thrown just four passes since then. The Niners hope Garoppolo can be the quarterback to lead the franchise out of its recent cycle of losing that started when Jim Harbaugh was let go as coach following the 2014 season. San Francisco won seven games the past two years with Colin Kaepernick and Blaine Gabbert sharing the quarterback duties. The winless 49ers are off to the worst start in franchise history this season in coach Kyle Shanahan’s first year at the helm. Veteran Brian Hoyer, who also began his career as Brady’s backup in New England, started the first six games and third-round rookie C.J. Beathard has struggled as the starter the past two weeks behind a patchwork line. He has been sacked 11 times on his 110 pass attempts and hit several others, with Niners’ injury-riddled line giving him little time to succeed. 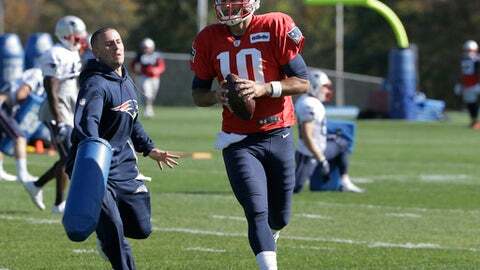 Garoppolo is the second backup quarterback to be traded by the Patriots this season. They dealt Jacoby Brissett to Indianapolis last month for receiver Phillip Dorsett. New England now has no backup on the roster for the 40-year-old Brady and no quarterback of the future for whenever Brady decides to retire. Now the Patriots could try to bring back Hoyer. A person with knowledge of the 49ers’ plans says the team has released him following the trade. The person spoke on condition of anonymity because the move had not been announced.